Shane tries to sell a boatload worth of pot to his teacher, $4,000 worth, to be exact. It's clear this educator is a first-class jerk and he proves as much by driving away with the marijuana without paying Shane. We have a feeling the youngest Botwin will plot revenge against this law-breaker. Meanwhile, Silas and Doug have better luck with their venture. After initially being turned down by a woman that's renting out her dry cleaning store, their new friend (and business partner), the town sheriff, steps in and seals the deal. They now have a location for their medical marijuana store. While all this is going down, Andy is trying to be brave. He offers to serve as Nancy's bodyguard, but is laughed at by Esteban. 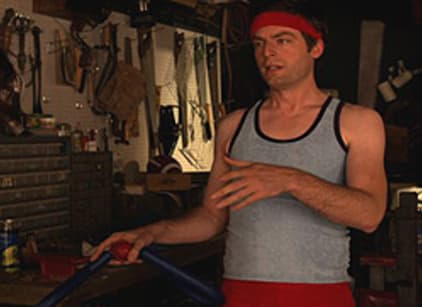 As a result, he tries to work out in the garage and bulk up, and guess what he finds tucked inside an old boxing glove of Judah's: a bank account book. Turns out Judah has $186,000 hidden in an account. When Andy goes to the bank and pretends to be his late brother, though, he's in for a surprise: the teller knew Judah and is incredibly broken up about his death, once Andy informs her of it. Later, as these two sit by the beach, the lady agrees to help Andy get the money, under one freaky condition: they date, and Andy pretends to be his brother. Finally, on to Nancy: her actual bodyguard comes across Agent Roy Till lurking outside. Once both these men's backs are turned, though, Nancy electrecutes them and ties them up. There's just one problem: who does she free? Whichever men is let loose freely admits that he'll kill the other. Adding to her stress is the fact that Celia shows up. When she requests to crash on Nancy's porch, Nancy throws her out of the house by flicking lit matches in her direction. These two are great together. Unable to decide what to do with her two captured men, Nancy calls Esteban. He comes over, happy because he's learned that Nancy is having a boy. Late in the episode, we see Nancy's Mexican bodyguard walking around, leaving viewers to assume that Till is dead. Pleased with the news of his son, Esteban actually embraces Nancy on the beach as the episode comes to an end. She seems to accept and almost enjoy it, but we'd like to assume it's just a case of her playing games with the drug lord, as she tries to think up a way out of the situation.